Both the NRA and the fossil fuel industry are the harbingers of death they wield their power with legislative impunity thanks to their minions in the GOP. Republicans receive generous compensation in return for the political protection they provide. 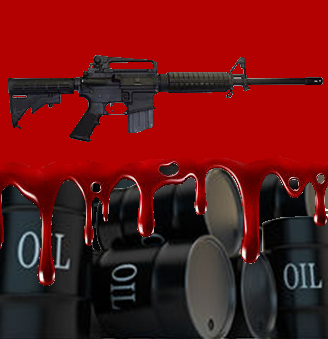 Americans are being killed by the NRA's gun advocacy and the fossil fuel industry's pollution. Both the NRA and the fossil fuel industry deceive Americans through sophisticated misinformation campaigns and outright lies. Wanting to protect kids from gun violence in schools is something everyone can agree with. Similarly, we should also want to protect our kids from the far more deadly effects of climate change. Just as gun violence is abetted by the powerful lobbying efforts of NRA, the fossil fuel industry's control over the GOP has stymied climate action. It is no secret that both the NRA and the fossil fuel industry have bought the support of legislators. It is the height of hypocrisy that Trump campaigned on a platform of "draining the swamp". The truth is these two lobby groups have never had more influence in Washington and statehouses across the country. Protecting children from harm is a cultural universal, but we must concede that we failed to do so after the massacre at Sandy Hook Elementary School on December 14th, 2012. We must also admit that we are failing to protect our children from the deadly impacts of climate change. While there is growing agreement surrounding the need to protect children from gun violence, we must also protect our kids from the far deadlier scourage of climate change that kills up to 1000 children every day. It is not only that Republicans and the NRA oppose common-sense gun safety legislation, they have also killed government support for researchers studying gun violence. Perhaps it may have to do with the fact that research findings contradict their position. For example, studies show that owning a gun to protect your family actually makes your home much less safe. So it is absurd to suggest that the solution is more guns. This is eerily reminiscent of the Republican subterfuge supporting the fossil fuel industry's obfuscation. Like the NRA the fossil fuel industry opposes both climate action and the science that studies it. The tobacco industry, big sugar, the NRA and the fossil fuel industry are masters in the art of deception and subterfuge. They buy politicians and manipulate public opinion to serve their own interests. These interests are antithetical to the national interest and the government's responsibility to protect its citizens. As reported by Everytown, CDC statistics indicate that there were 175,703 firearm deaths in the US from 2012 to 2016. This averages out to nearly 13,000 gun homicides a year or 96 deaths each day including seven children and teens every day. For every one person killed with guns, two more are injured. Over the last five years, there are an average of 200 people injured by firearms each day. Fossil fuels are a leading source of global warming causing emissions. Climate change already kills people and animals it has already laid waste to vast swaths of coral in the Great Barrier Reef and the Arctic is on the cusp of a death spiral. Going forward the range of possible climate impacts are terrifying. Attribution science demonstrates that climate change is deadly. However, exact estimates of the number of deaths caused by climate change are hard to quantify. Although estimates vary, a review of the research suggests that we can conservatively estimate that at least 100,000 people are killed by climate change each year with millions more suffering from related adverse health impacts. Others suggest that as many as 400,000 people die each year because of climate change and more than a billion people may be adversely impacted. Whatever this number may be it is expected to grow as the planet gets hotter. We know with considerable certainty that climate change increases the intensity of extreme weather events. We also know that the fossil fuel industry is a leading cause of extreme weather. Heat waves alone cause fatal heat stress that has killed tens of thousands of people in some years (in 2003 more than 70,000 people died from a heat wave in Europe). The warming planet also exacerbates potentially fatal consequences of inadequate water supplies, undernutrition and disease. Global warming affects both the social and environmental determinants of health. We are talking about the basics required to sustain life (clean air, safe drinking water, sufficient food and secure shelter). The WHO lists malnutrition, malaria, diarrhea and heat stress as the leading causes of climate change related mortality. Climate change undermines food production and causes undernutrition, which currently causes 3.1 million deaths every year. Climate change also causes extreme weather that according the WHO currently kills an average of 60,000 people each year. Disease is another fatal corollary of climate change. According to a 2012 study called "Climate Vulnerability Monitor" climate change is killing 400,000 people annually. The WHO states that between 2030 and 2050 climate change is expected to cause approximately 250,000 additional deaths per year. As reported by Weather.com, Saskia Heijnen of Wellcome Trust, a London-based biomedical research charity, corroborated the WHO's research. The fossil fuel industry is the leading cause of deadly air pollution that is known to cause cardiovascular and respiratory disease. The high temperatures associated with global warming exacerbate the problem. As reported in Science Daily, a 2017 study from the University of North Carolina at Chapel Hill estimates that air pollution associated with unchecked climate change will cause 60,000 deaths globally in the year 2030 and 260,000 deaths in 2100. Despite these depressing statistics, we may be approaching the critical mass required to make the necessary political changes. The movement against the NRA and their representatives in Congress also has implications for the fossil fuel industry. Gun safety advocates have joined climate advocates to challenge the Trump administration and Republican legislators. Led by students and corporations, people across the country are challenging the NRA. The demand for responsible gun safety is part of a movement that threatens to weaken the NRA and enfeeble the GOP in the forthcoming midterm elections. People want to protect kids from gun violence and similar sentiments are driving resistance to the fossil fuel industry.